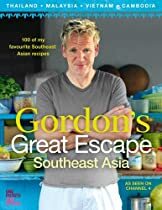 On the second leg of his Great Escapes series, Gordon Ramsay sets out to discover the flavours of Asia, on a remarkable journey that leads him through Thailand, Cambodia, Malaysia and Vietnam. 100 new recipes are inspired by the tastes and experiences he encounters along the way.In this book to accompany the TV series, stunning photography and Gordon’s inspirational travel stories combine to depict a richly-textured portrait of a continent. With breathtaking landscapes as his backdrop, Gordon is welcomed into local communities and shown the age-old traditions and secrets that underpin their native dishes. He meets characters with fascinating lives, shares delicious meals in beautiful surroundings, and is invited to take part in the customs and rituals of the land – venturing into paddy fields to observe the rice worship, accompanying huntsmen on their quest for frogs and honey, navigating the inky night-time ocean for moonlit fishing, and cooking up a feast in a colossal Malay temple.Gordon has devised over 100 new recipes to showcase the very essence of these cultures and cuisines. There are unique tastes and styles from across the region, with a wealth of enticing ingredients: from tangy limes and the earthy scent of sesame oil, to floral jasmine and lush green banana leaves. Don’t let unfamiliar recipe names put you off – Tom Yam Goong Nam Khon is a divine hot and sour prawn soup, Ngah Poh Kai Fan a slow-cooked clay-pot chicken and Karipap the Malay answer to a Cornish pastie.And there are recipes that even wary cooks will recognise – Chicken Satay, Pad Thai, Red and Green Curries – though look closer and each recipe has something extra, an authenticity that comes from taking the time to understand the origins of the dish. Gordon proves that the real thing is easy to replicate at home, whether its a single spice that makes all the difference, marinating a cut of meat for 12 unhurried hours, or being brave enough to try a key new ingredient such as kaffir lime leaves or lemongrass (readily available in supermarkets but often overlooked).Let Gordon open your eyes with his vivid portrayal of a magnificent continent, and enjoy some of the very greatest Asian dishes in your own kitchen.